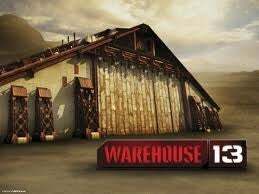 OK, not sure if I'm the only one who cares about this, but for some reason SyFy has the premier episode of the new season of Warehouse 13 on their site right now. Find it here. If you want to watch it on TV, please don't click that link. EDIT: After the TV premier, I plan on starting a thread on the Observation Deck to discuss this episode because I really want to talk about the thing that happened with the person and the other thing and oh yeah, the thing that is going to be a thing.